Delfts Blauw Windmills ceramic Beer Mug from Holland. Porcelain Beer Stein, AVON Building of America. 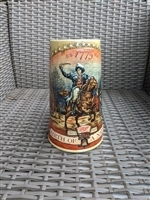 Miller Beer Stein - Birth Of America. Embossed porcelain with patriotic decorations. Royal Daulton character jugs, Old Charley large toby jug. 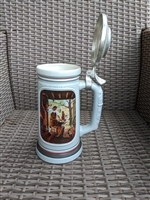 Beer Stein, SPORT by Norman Rockwell Miller brewery. BAYERN Crest ceramic beer stein made in Germany. German Beer Steins, set of two with DBGM and ORM in diamond. Tavern and Hunters scenery. German Salt Glazed jug with handle and top stopper Wellingholzhausen. Vintage Pepsi Cola stained glass design pitcher and four glasses set. Italian leather wrapped green glass bottle, TURTLE shaped vintage decor.